It has been a LONG time coming… I am VERY happy to announce that we have a beautiful new watermaker! AND IT’S MAKING WATER! Lots of it! 33 gallons per hour! Richard took the lead on this project and decided that the old system that was making 18ish gallons per hour had to go – many of the gauges didn’t work and it generally had done its job over 20+ years and was time to be replaced. So, off he went searching the internet for the best replacement. 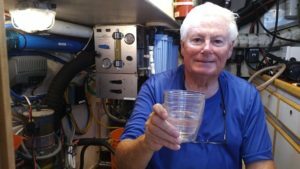 He chose to source most of the items from Cruise RO Water – we’ve worked with Rich before and always found him to be knowledgable with good products at reasonable prices. So, gauges and membrane acquired, it was time for the new plumbing. Richard chose a ‘push fit’ system of hoses and connectors, the Mur-lok brand. Sourcing these were a bit more of a challenge, but Richard was up to it and we returned to New Zealand with many bits and bobs. 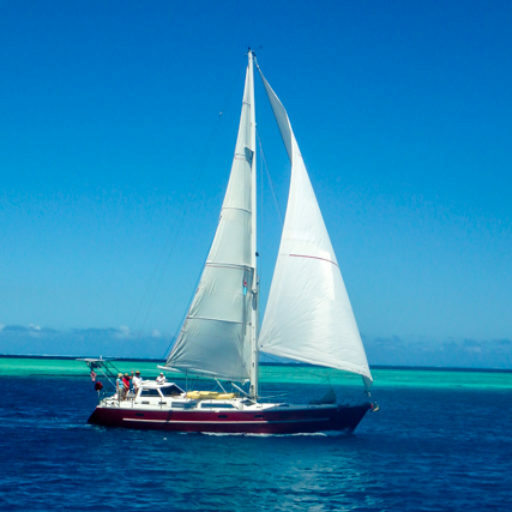 Then we sailed to Fiji, because, well, FIJI… (We’ve been eager to get here this season, but well, ‘life happened’) And we decided it’s time to commission the watermaker… And after chasing some ghosts, priming the pump, etc., we are actually ‘making’ water! (reverse osmosis) The first thing I did was take a shower! Now, we’ve just heard the first two “boom”s of the tank reaching full. (There are 3 total booms on the port tank) Music to our ears! Now there’s a long tall drink of water!